Shop Olinda Ridge Olive Company online at OlindaRidge.com for all your olive oil, gourmet vinegar & gift. Olinda Ridge Olive Company handcrafts some of the finest extra virgin olive oils in the world, straight from Northern California. Olinda Ridge Olive Company uses natural and sustainable farming methods and a small batch-crafted process to ensure that their extra virgin olive oils have superb flavor, are of the freshest and highest quality, and maximize health benefits. Save on your next purchase from OlindaRidge.com with OlindaRidge.com discounts, OlindaRidge.com coupons and OlindaRidge.com savings from 58coupons.com. Save 10% on Olinda Ridge Extra Virgin Olive Oil with this coupon code. Enjoy free shipping on orders over $150 or more from OlindaRidge.com. Click link to start shopping. Olinda Ridge Olive Company is giving away a bottle of gourmet vinegar with first orders using this coupon code. Click link now. Purchase a case of Handcrafted Olive Oil from OlindaRidge.com and save $34 plus receive free shipping. Click link for details. Enjoy $5 Flat Rate shipping from Olinda Ridge Olive Company with purchase of $75 - $149. Orders over $150 receive free shipping. Purchase a case of Gourmet Vinegar from OlindaRidge.com and save $10. Click link to view all the delicious Gourmet Vinegar's. 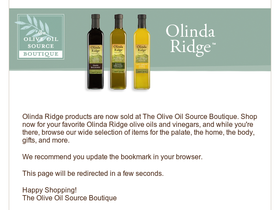 Get on over to Olinda Ridge Olive Company and sign-up for their newsletter to save 15%. Click link to sign-up now and start saving. Fabulous gift sets starting at only $29.50 from Olinda Ridge Olive Co. Click link to view.